An active Windsor couple downsizes with ease to a stylish new townhouse. 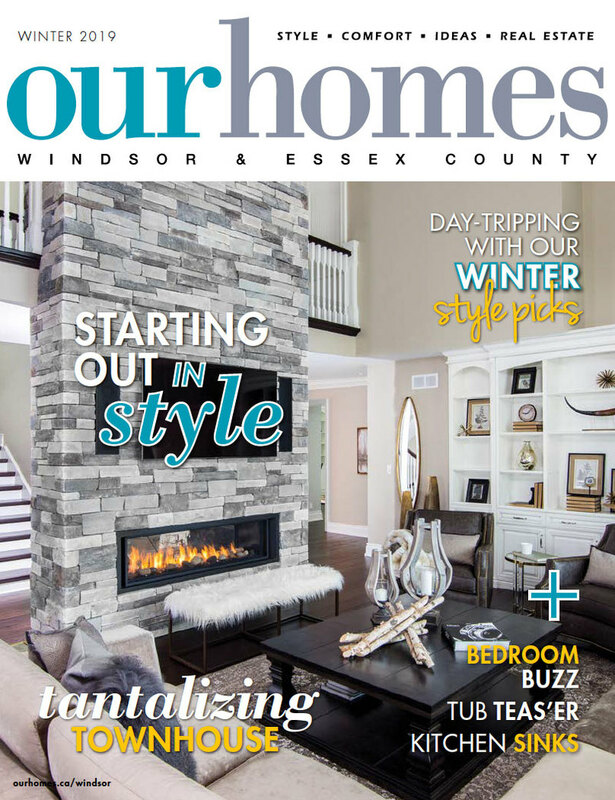 A version of this article originally appeared in the Winter 2019 issue of OUR HOMES Windsor & Essex County, p.38. Find local businesses in our Windsor directory. 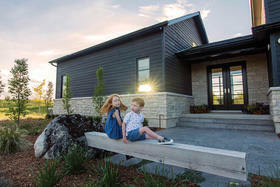 Giving up the ride-on lawnmowers, snowblowers and maintenance issues that come with older homes is becoming more and more appealing to a growing and younger group of the population. It certainly was the goal of this very active and sporty couple who love to travel – and the Villas at Forest Trails turned out to be the perfect place for them to realize their dream of early downsizing. 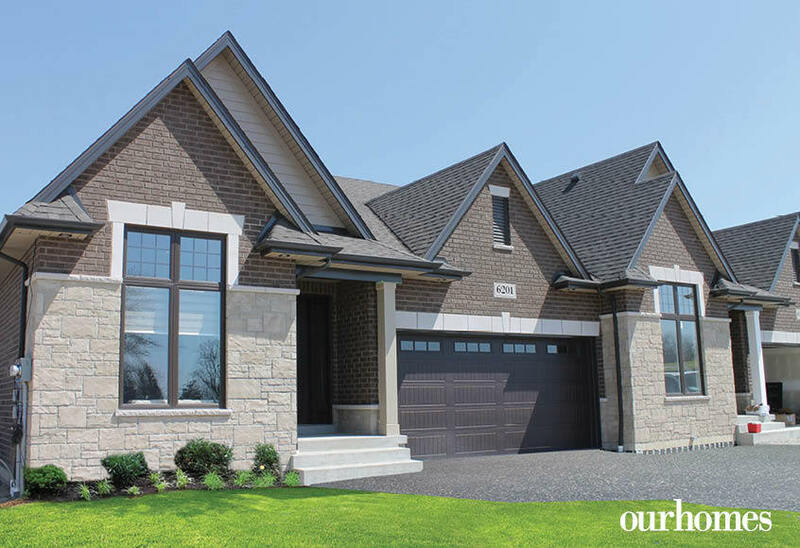 Timberland Homes designed this townhome for maximum comfort and style, offering a combination of luxury, location, convenience and freedom. 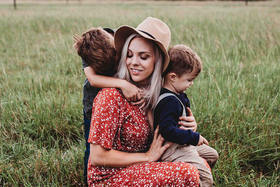 The owners enlisted the design expertise of Rebecca Colautti from Bertoni Chairs & Things and set about making their new space into the ideal launch pad from which to enjoy their new life. 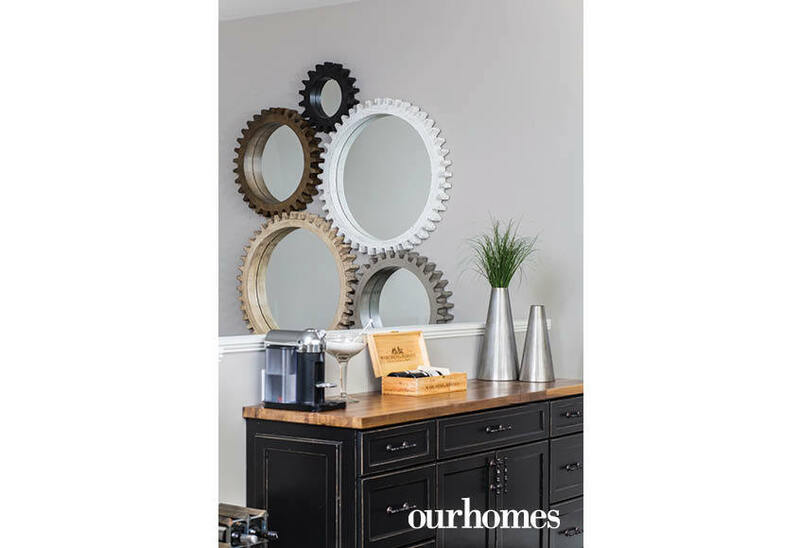 The elegant foyer sets the tone for the quality and finishes found throughout the home. Wainscotting is painted in a neutral grey and is a perfect choice with the trey ceiling. 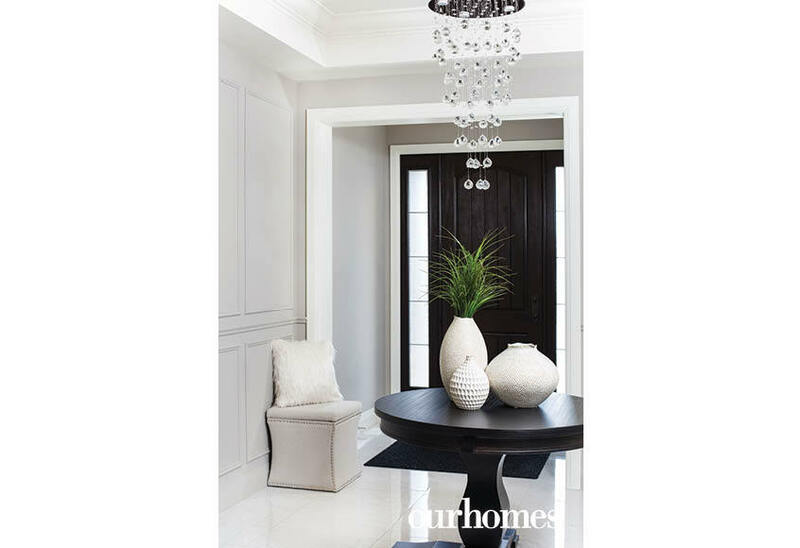 To take advantage of the spacious entryway, Rebecca chose a wire-brushed pedestal table instead of a wall console. 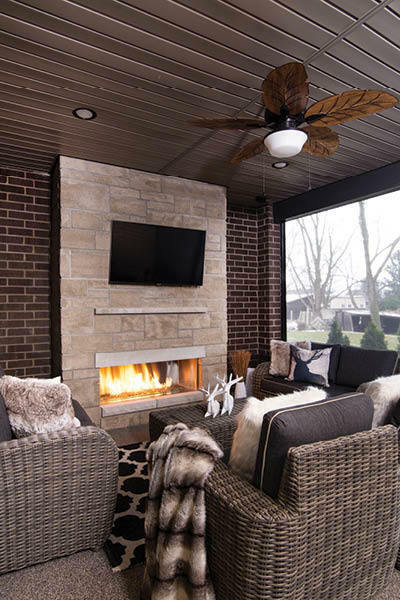 The homeowners vetoed a traditional fireplace in the living room, instead selecting a peel-and-stick, solid wood Stickwood wall covering. It gives the room warmth, texture and an organic design element that is a great backdrop for the walnut, mid-century designed credenza (Bertoni Chairs & Things) and flat-screen television. In the great room the design began with a 100 per cent hair-on-hide area rug statement piece. 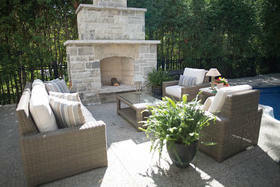 Two, three-seater salt-and-pepper tweed sofas and two Geno chairs round out the space. 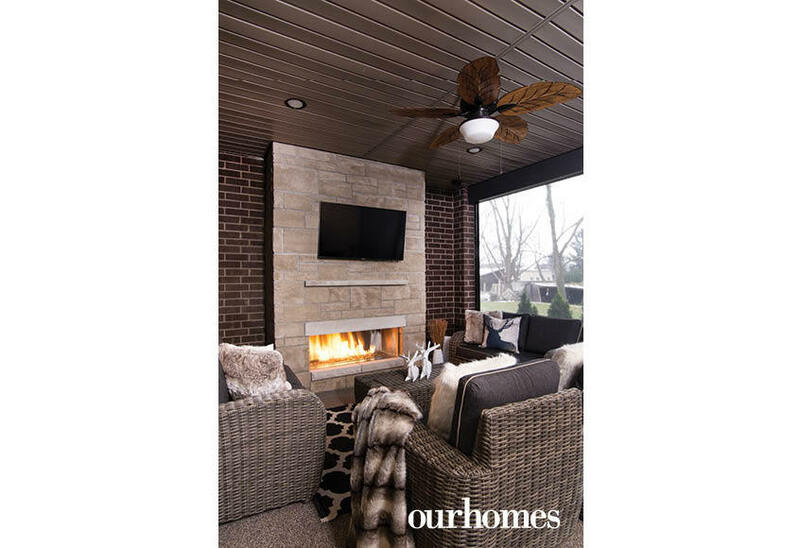 The coffered ceiling is another high-end touch, as is the screened-in porch (Seaton Sunrooms) with a roaring fireplace (Forest Glade Fireplaces) that extends the living area three seasons of the year. 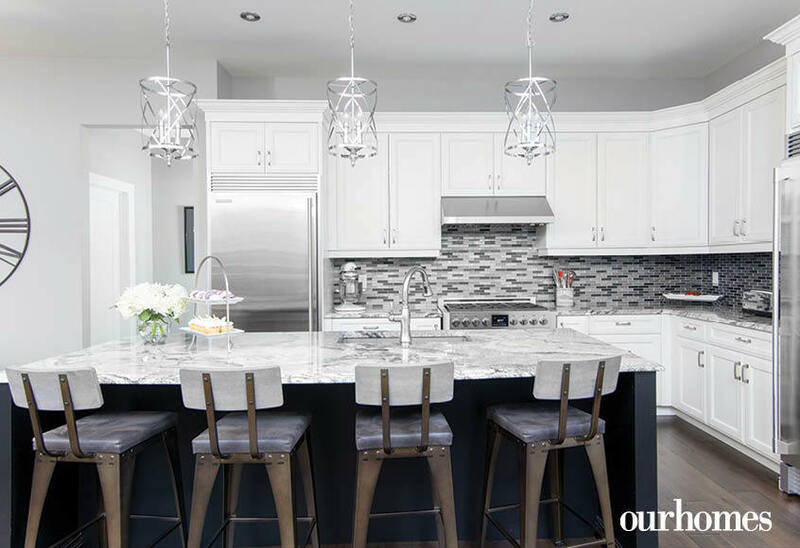 Because the homeowners love to entertain, both the kitchen (Cremasco Fine Cabinetry) and the dining area were high on their list of priorities. 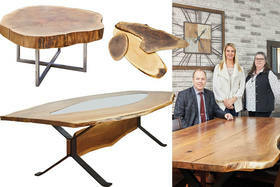 They chose a double-pedestal harvest table that extends to accommodate 12 at a sit-down dinner. Appliances are from The Appliance Shoppe. In the generous master bedroom suite, the en suite has an oversize shower (Bay-View Glass & Mirror Ltd.) and large walk-in closet. 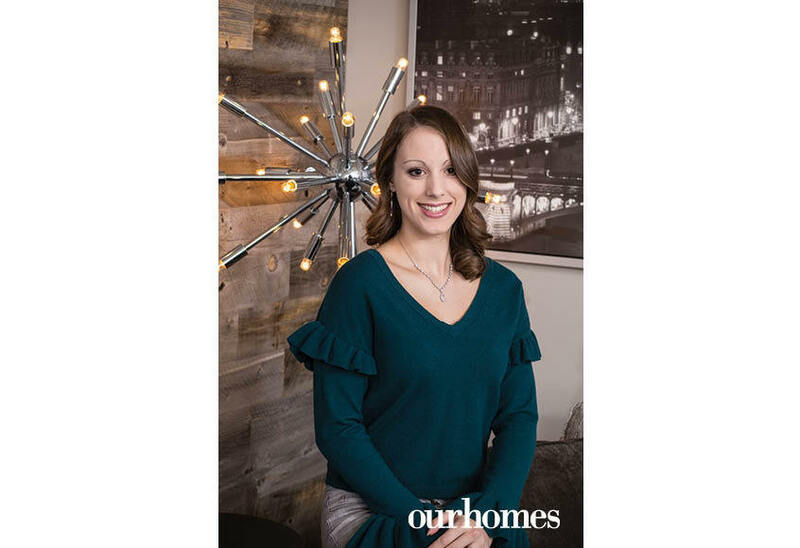 With Energy Star certification, great location and exciting floor plans, the townhome Villas at Foreset Trails are an excellent downsizing solution. The pedestal table elegantly dresses up the foyer and is ready to accept both keys and handbags after a long day at work. The elegant chandelier is from The Lighting Boutique. 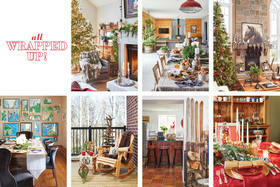 Designer Rebecca Colautti of Bertoni Chairs & Things. The homeowners loved the hair-on-hide area rug in their living room. 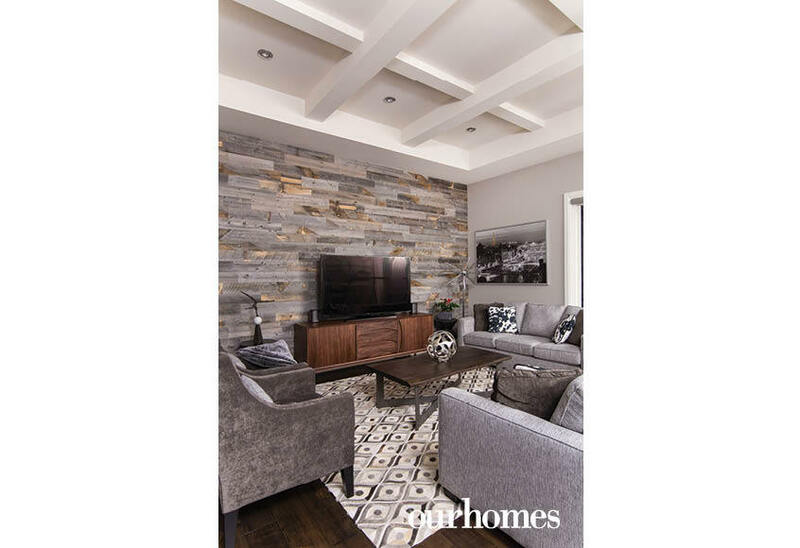 The pattern adds interest and plays off the mixture of weathered wood, espresso wood and cherry wood in the room. 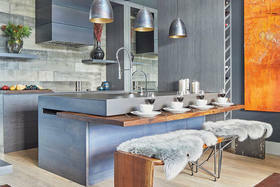 The bar unit is an heirloom piece and was built by the homeowner’s 80-year-old father. It is finished in a distressed black to coordinate with the kitchen island and was topped with natural walnut by Frank Cremasco Fine Cabinetry. The homeowner has a love of all things French, including the Mona Lisa. Nailhead trim on the crisp dining chairs brings texture. The kitchen is efficient and streamlined with a large island and plenty of cabinetry. The screened-in porch from Seaton Sunrooms adds light, space and a feeling of being close to nature. With the roaring fire and cosy furnishings, it extends the couple’s entertaining space and is used three seasons a year. The headboard in the master bedroom is a deep, restful grey and boasts an abundance of tufts and nail-heads for maximum elegance. The en suite has a generous oversize shower and leads into a walk-in closet.